Is it a bird? Is it a plane? Nearly; it's Livid Instruments' Guitar Wing, and the guitar-mounted app and DAW controller is the latest crowdfunding success story in the gear world. It could also be a user-friendly solution for players wanting to integrate apps and software on stage and in the studio with minimal hassle. Following a 30-day Kickstarter.com campaign launched during the NAMM show at the beginning of the year, the Guitar Wing smashed its $45,000 target to greenlight manufacturing and is now shipping via the Livid Instruments website for $199 and select online retailers in the UK for £165. The interface can communicate wirelessly with any music software that supports MIDI; including popular programs such as Logic, Guitar Rig, GarageBand and Reason; plus the bundled plug-in WingFX. 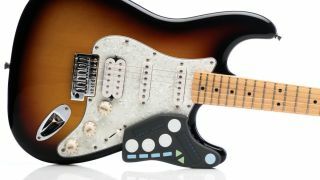 The Guitar Wing seeks to make MIDI intregration between player, guitar and software a user-friendly and practical experience. Fixing it to your guitar is straightforward and opens your tone up to a world of possibility; the Guitar Wing can can act as a whammy bar, stomp box, sampler, sampler or even a handy controller for your recording software when you're tracking parts. Check out Livid Instruments' Guitar Wing controlling Guitar Rig software in the demo video below.